The Downtown Rotary Club of New Braunfels is a 100% Paul Harris Fellow club. 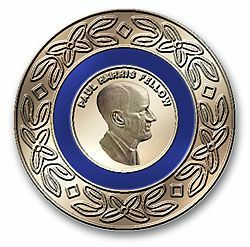 Every member of the club has shown their commitment to the efforts of Rotary International by becoming a Paul Harris Fellow. Very few clubs within Rotary International have 100% of their members make this financial commitment. Paul Harris was the founder of Rotary International. Individual Rotarians who donate $1,000 or more to the Annual Programs Fund, PolioPlus, or the Humanitarian Grants Program become members of the Rotary Foundation and are recognized as Paul Harris Fellows. Welcome to the Downtown Rotary Club of New Braunfels website!